If you have a Mac with an SSD or otherwise limited disk space (like the MacBook Air 11″ with a 64GB drive), you might consider moving your iPhone backup folder to another drive to save some of that precious SSD space. Before proceeding you might want to determine if this is necessary for you. 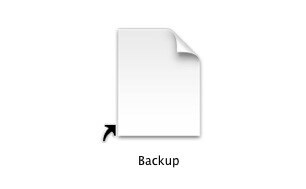 Do this by checking the size of the iTunes “Backup” folder that we reference below, just click on it and select “Get Info” to calculate it’s size. In my case, the Backup folder is 6GB, so with the small MacBook Air SSD I could immediately save 10% of disk space by relocating the backup elsewhere. With this in mind, here’s how to move the often large iTunes backup to an external drive. What else can I do to save iTunes related disk space? In the comments, Dan suggests moving the iTunes media library to an external drive to save even more space. This is a great suggestion to combine with the above tip.